One of the most important things you can do to progress your business and to make your life easy in general, is to build a team. Another thing you can do is to delegate, and another thing is you can outsource. The reason that I want to talk about this today is because many people confuse them, and think they are the same. I would contend that they are not the same. Okay — let’s jump into this and start with one of my favorites. For me, I outsource every single day. It can get a little confusing because some of my team outsources on my behalf. For example — this podcast will be outsourced for the transcription portion of it. That will become the basis for the shownotes in the post. Now, we also outsource to transcription services on Fiverr as well. There are some that are excellent and then there are some that are not so good — but it only costs around $5. My other favorite source for outsourcing is Freelancer.com. Outsourcing for me, means one off tasks. One off tasks are tasks that are special and require a specialist to handle it. These will be people that you do not have in house to handle these tasks. For example – if you need some complicated video editing or music editing, then you would have a specialist take care of that task for you. We outsource them to freelancers who are specialists in that area. They choose to do this as their main job or even as a sidejob. These people work from anywhere in the world. Now delegating is when you have a task or something you need to get done, but you don’t have the time yourself to get it accomplished. It can also be something that you are not so good at and need to pass it off to one of your staff or team. There are things you are going to be great at and then there are those things you are not so great at. Those will be what you delegate to others. For example — I will use me. Marketing is something that I don’t delegate or outsource because it is something that I love to do. However, when it comes to finance or secretarial type skills — those are not my strengths, so I delegate them to people on my team. 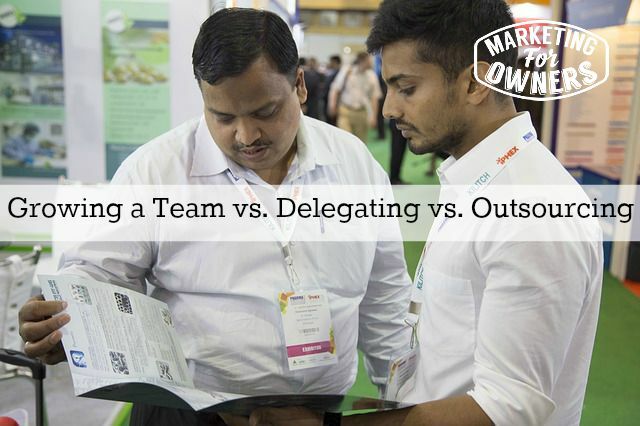 Now, I had discussed delegating quite a lot here at Marketing for Owners. You need to understand that when you delegate, you are giving a job to somebody else to do. Hopefully that person will be better than you. They’ve got more time, they’ve got better skills. It’s just a better use of your work, so do not instruct them too much on how to do it. The reason you are asking is because they know how to do it and do it right. Be careful with delegating because it is an essential skill that every business owner needs to learn. Without it you will get nowhere. Building a team is different. You can create a team with outsourcers, but outsourcers are freelancers who bid on jobs one at a time. You can use them again and again and again, but they don’t seem to have any form of retainer. If you go to Fiverr, you can’t hire someone and keep them on retainer to use them again and again. When you delegate, you delegate to members of your team, so you need to make one. It can be staff or people you have found to use to build your team. Let’s use Marketing for Owners for example. At the moment, we have 3 writers, a video editor, my assistant, but my assistant does so much. I make it sound like she is just MY assistant, but she’s not. Jennifer does lots and is multi-skilled. I have never had any kind of personal assistant in my life, and honestly I would not know how to work with one. We also have Claire on my team. She creates graphic works and courses as well as videos and edits them as well. We have a very diverse team, but we all work together amazingly. These people on my team all receive work regularly, every single month. They are guaranteed a payment. In fact, as the business builds, I expect to give them more work and then over time offer them a full time position. They can stay where ever they are. They are my team and that team will build over time. So remember, you can outsource tasks, you can delegate projects to your team, and you want a solid reliable team. Today is Tuesday and that means it is time for a Toolbox Tip. Now, today’s tip will help you with your outsourcing. 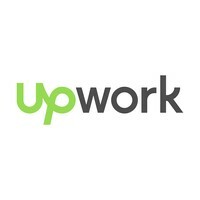 Let me tell you about Upwork. The reason that I am bringing up Upwork, because in the past I have recommended Elance, and recently Elance merged with ODesk, and named themselves Upwork. It has become much bigger and they have a modern interface which makes it much easier to use. I recommend you go there and try it out. It is a fabulous tool to have in your arsenal. Which one do you need to work on the most?